Our domestic feline friends often feel like tiny wild animals. They stalk prey like a big cat and even fight like they’re 10 times their size. But how do they hold up when faced with real wildlife? These videos will amaze you! In this video, a brave little kitty faces up to a ferocious mountain lion with just a thin pane of glass in between them. Pay close attention to the man’s commentary! If you thought the first video was intense, you haven’t seen anything yet. 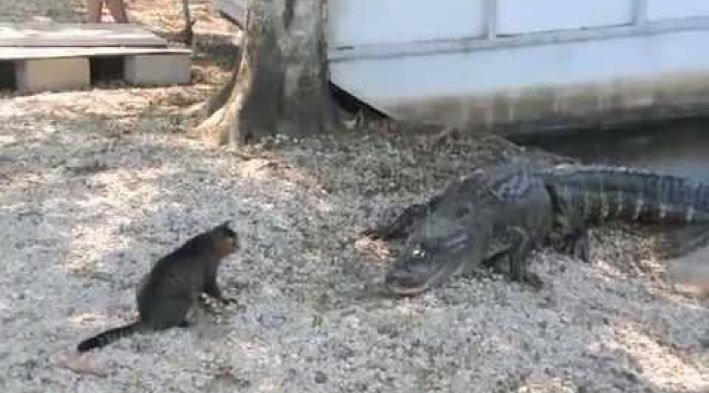 In this one, a house cat faces up to two alligators – without a protective window keeping them apart thank God. In this video, a house cat is every bit as good as a guard dog, maybe even better. Tara the cat knows no fear. This one’s a little lower key than the earlier ones on our list. It’s an intriguing insider’s view on how cats and possums interact at night. 6. Amazing Cat Faces a BEAR! This cat, once again, proves that some domestic felines operate even better than guard dogs. And some cats simply know no fear. This cat has epitomized the “thug” life. Nothing’s going to get him down, not even a bear. You won’t see any fights in this one, just two completely different species learning to get along. And here we have a cat and lion cub duo… They get along surprisingly well, considering their size differences. This amazing video shows monkeys stepping in and doing the humans’ jobs. Rather than a cat standing up to a wild animal, we see a group of monkeys policing a cat fight! Break it up guys! Let’s all play nice. Has your cat ever taken on a wild animal?